Our finest quality boots are constructed using 100% USA products. The leather is first quality cowhide - this means no range marks (scars) in the finish. The boots are machine sewn, NOT hand sewn. This means all seams are even and equally strong-no weak points to give or break under the stress of wearing. See our Shaft Size Chart to Ensure A Proper Fit For Your Leg. First quality cow leather with a sewn in gusset up the back to allow expansion up to an additional 3 inches. Made in the U.S., these boots also feature an oil resistant one piece sole. 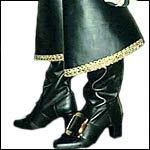 The perfect boot for the Renaissance or medieval wedding!